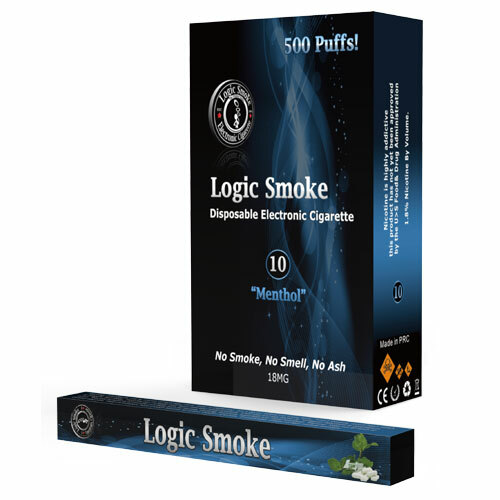 Minty and refreshing, Logic Smoke's Menthol flavored disposable cigarette gives menthol smokers the vape they love. 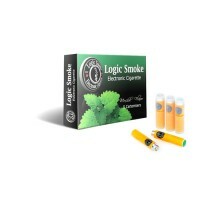 This top of the line disposable electronic cigarette from Logic Smoke has the newest technology. Made up of a cartomizer filled with the best eliquid and a lithium ion battery that comes completely charged and ready to go. There is no maintenance involved at all with this disposable electronic cigarette. Just open and start puffing. It's soft tip gives added feelings of smoking an analog cigarette and it is light weight and comfortable to hold and use. The Menthol disposable electronic cigarette comes in 5 strengths of nicotine that allow you to lower your nicotine level over time. These disposable cigarettes freshen up your palate while you exhale the cool you crave. Along with wonderful flavor, you will get clouds of vapor and hours of satisfaction. This is a great product for someone who is trying to get away from using or is unable to use real cigarettes. It eliminates smoke, ashtrays and all of the harmful carcinogens that come with smoking a regular cigarette. Not only that, it can be used almost anywhere, including places that ban regular cigarettes. Purchase one today for yourself, or a box of ten to share with loved ones, friends, co-workers...or anyone you'd like to give the gift of satisfaction, convenience and good taste to.